The newly launched Android smart phone HTC One will not only enhance the competition with the devices currently in the market but will also be a tough competitor for the devices like the Samsung Galaxy S4 which is going to be launched soon in the next few months. Therefore, we have pointed out five main points that may help the new HTC One to beat the soon-to-be-launched Samsung Galaxy S4. The polycarbonate plastic designs of Samsung smart phones has been around for quite some time and its almost getting old while HTC One’s sleek aluminum unibody is a totally different approach and have remained as one the most favorite part for most consumers. The full metal device, which is both minimalistic and rugged, not only looks pleasant but also wonderful to hold. The inclusion of the Ultrapixel camera in HTC One not only dwarfs the potentiality of Samsung Galaxy S4’s camera but will also compel other devices in the market to upgrade their camera features. The ultrapixel camera of HTC One consists of a 4-megapixel BSI sensor along with f/2.0 length which also performs wonderfully in low light. The wide-angle camera of HTC One is certainly a plus point for this device as this feature will help in extending its appeal to a wider group of people and will allow consumers to have better quality conference calls and video chats. However, the Samsung Galaxy S4 has no intention in incorporating anything more than the common 2MP front facing camera. The impressive audio features of HTC One is surely going to put shame on many smart phones including the Samsung Galaxy S4. 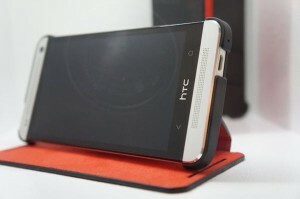 Unlike other smart phones, which cannot provide louder sound, this HTC One with its dual speaker on the front can emit louder sound without any distortion. It also contains built-in amplifiers, which will enable the consumer to share any song or video with their friends without cupping the speakers of the phone. The IR sensor is one of the unique features of HTC One which will enable the consumer to control their home-theater system and watch their favorite shows on television without any clutter. On the other hand, there is no news that Samsung is going to incorporate any such features in Galaxy S4 and might go with the traditional features like their earlier smart phones except for only a few minor changes.